Thank you for visiting the page to see the map! You can also join the Sneinton Neighbourhood Forum here. You can also check out the Forum constitution here. The Sneinton Vision project has laid down a lot of useful ground work by defining what sort of development people want to see in the area... but turning this into and actual Neighbourhood Plan with "teeth" will involve a number of steps. Firstly, a boundary for the plan area needs to be established. It should be sufficiently large to include sites for potential future development, clearly defined by physical elements like roads, rivers and hills, and have an identity that the people living there recognise. 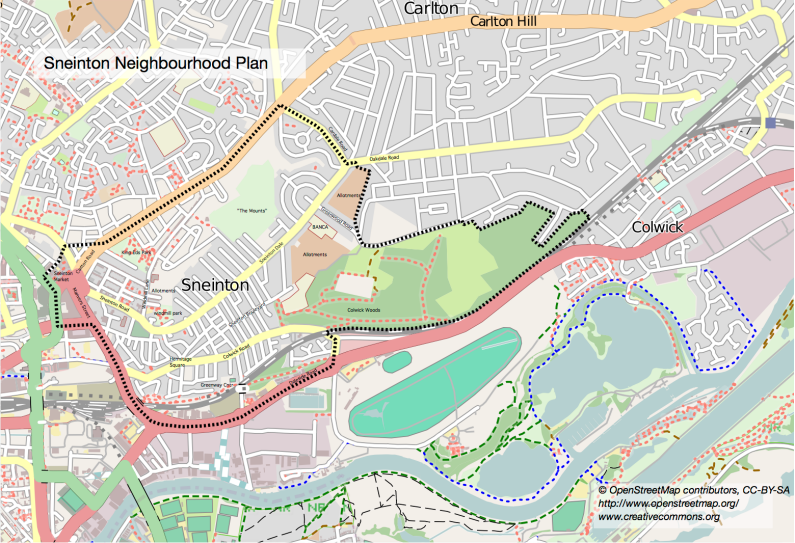 At an open meeting hosted by Sneinton Alchemy and facilitated by Planning with People, a draft plan boundary was produced. A 3-month long consultation with local residents and interested parties has resulted in some revisions to the plan- notably the inclusion of the Sneinton Elements area between Windmill Lane and Carlton Road, and the inclusion of Colwick Woods. Further consultation was carried out on this plan before it was submitted to Nottingham City Council for consideration on March 31st 2014.